For commercial use of this photograph please visit www.alamy.com and search for RJ9YX1 but for a one off print, please see below. 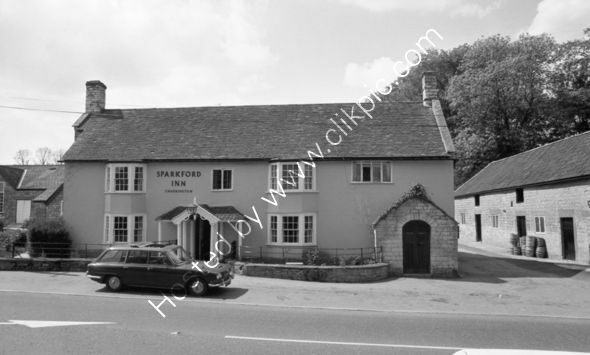 Photo survey of the Sparkford Inn, Yeovil prior to the 1975 refurbishment. Bass Charrington were undergoing a branding change and the Charrington signage on this photo was changed to Bass during the refurbishment. Note the fold-back canvas sun-roof on the car. Empty kegs are stacked against the right hand side out-building.